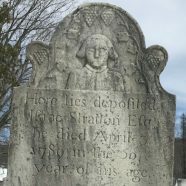 On Saturday, May 5 at 2 p.m., you are invited to join us at the graveside of Isaac Stratton in Southlawn Cemetery for a brief ceremony honoring South Williamstown’s first European settler. This event is being held to recognize the recent installation of a flag holder indicating that Stratton fought in the American Revolution. In addition to settling South Williamstown, Isaac Stratton farmed the land, served as an early town clerk, and contributed a great deal to the life and growth of Williamstown. Regina Rouse, who has researched and carried out a successful project to preserve the historic headstones of Southlawn Cemetery, will present information about Isaac Stratton’s historic life. Following the recognition event, refreshments will be served next door at the Williamstown Historical Museum. In the event of rain, the program will begin at the Museum. This cooperative program is sponsored by the South Williamstown Community Association in collaboration with the Williamstown Historical Museum.